JM Travels is one of the foremost travel rental service provider have years of good foundation on travel services along with rental and hire services for vehicles needed for tour or other specific purposes also. 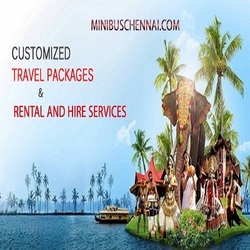 They provide wide variety of facilitated with seated capacities for hire like 12 , 18 seater tempo traveller in chennai , Hi tech mini bus hire etc. with luxurious accessories. So in order to ensure you this complete fine journey they are open for all the time throughout 24 hours.